While the average emergency room wait times for low-acuity patients were up to two-and-a-half hours at NewYork-Presbyterian/Weill Cornell Medical Center, the provider’s Telehealth Express Care service can get patients in and out in 35 minutes. NewYork-Presbyterian is steadily moving to use telehealth to its advantage. As a result, emergency room wait times at its Weill Cornell Medical Center have been slashed by more than half because of its Telehealth Express Care virtual visit service. For example, average emergency room wait times for low-acuity patients used to mean a two to two-and-a-half hour wait. But now, the Telehealth Express Care service can get low-acuity patients in and out, from arrival to discharge, in 35-40 minutes. NewYork-Presbyterian/Weill Cornell Medical Center has conducted more than 3,000 Telehealth Express Care Service visits to date. In terms of quality and consistency, every patient, no matter the location, gets the exact same screening and triage. A triage nurse asks for the chief complaint and takes vitals, and a nurse practitioner or physician assistant examines the patient to make sure he or she is stable for the express service. Express patients then are sent to rooms where they have video visits with ER physicians who are elsewhere in the health system. “The doctors are New York-Presbyterian/Weill Cornell Medical Center faculty members,” Sharma said. “They are our doctors. No outsourcing. They are the same doctors who work in the emergency department, but are on different shifts. They are located two buildings away in a separate room at NewYork-Presbyterian. 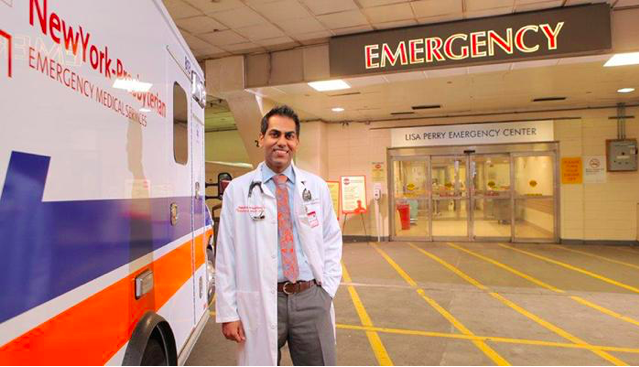 And they are seeing patients both in our Weill Cornell campus and our Lower Manhattan emergency department downtown. The express service was launched in July 2016 on the Weill Cornell campus. The provider uses Avizia telemedicine carts for the service. A month and a half after the launch, the provider expanded the service to its Lower Manhattan hospital campus. It then also launched a mobile app where patients can see the same physicians from home.